There is absolutely no doubt that we love Bollywood movies. Bollywood movies are ingrained in most of our minds, from the songs we hum every day, to the famous dialogues we use in passing conversations. We love the stars and are also crazy fans for some. But, apart from all of this, there is no denying the fact that the movies we so love set unachievable expectations when it comes to our own lives. Here, we look at some unrealistic expectations Bollywood movies give us. "Rahul, naam toh suna hi hoga!" True love's name is Rahul. Yes, we said it. And yes you know it's true. 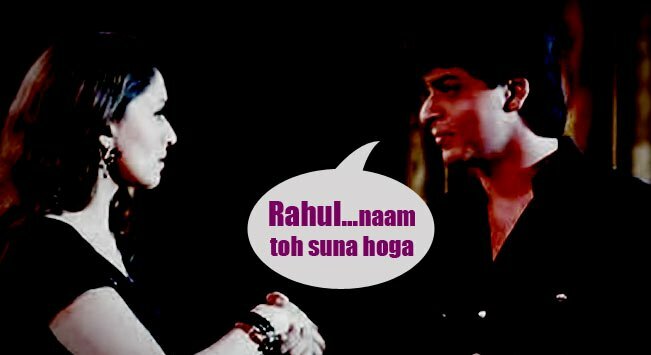 Bollywood movies have given us such high expectations from men who are named ‘Rahul'. If he is Rahul, then he has to be smart, handsome, charming, funny and of course, someone who will love you unconditionally. This doesn't really happen in real life though. We mean the ‘Rahul' you know can be all of these things, but he can also be the exact opposite. So beware! "Ek Ladka Aur Ek Ladki Kabhi Dost Nahi Ho Sakte"
This one is utter rubbish! A boy and a girl can definitely be friends without any romantic feelings for each other at any point in their friendship. It's not written in stone that you will fall in love with your friend in the end. So, the next time your buddy tries to use the "ek ladka aur ek ladki kabhi dost nahi ho sakte" line on you , don't fall for it! Not all love in life is unrequited and not all lovers are star-crossed lovers. If you don't know what it means, well, star-crossed lovers are those who do not end up together in the end. However, normal couples also exist in this world who love each other and are together. You are not bound to be forever alone. FALSE! The wind causing your hair to fly doesn't look as glamorous as it does on the silver screen. In fact, it doesn't look glamorous at all. Your hair fly into your eyes and mouth, and it is downright annoying. And, don't even get us started on what hair look like once the wind is done playing with them. We don't know a single individual who looks well-groomed in the morning, as if they have just stepped out of the salon. But, in movies, they do. In real life, we wake up messed up and with morning breath, and truth be told, we'd rather not wake up at all and just stay in bed all day. This one is a real disappointment. Thinking of all those childhood years we spent just waiting for the time, when people around us would break into spontaneous synchronized dancing, is just plain painful. It's never going to happen, ever! Train stations and airports have been exploited frequently as the meeting spot for two lovers. Bollywood makes you believe that nearly missing your train is always a good thing, for there will always be someone to pull you on board and this person will end up being your true love. As for airports, if you love someone and they are leaving the country for whatever reason, chasing them through the airport and being held down by the security is the perfect way to confess your love to them, right? Wrong! If you are late for your train, you miss it. That's it. Your true love will not give you their hand, or pull the chain for you. Speaking of airports, don't even think of it, you will most definitely end up in jail.